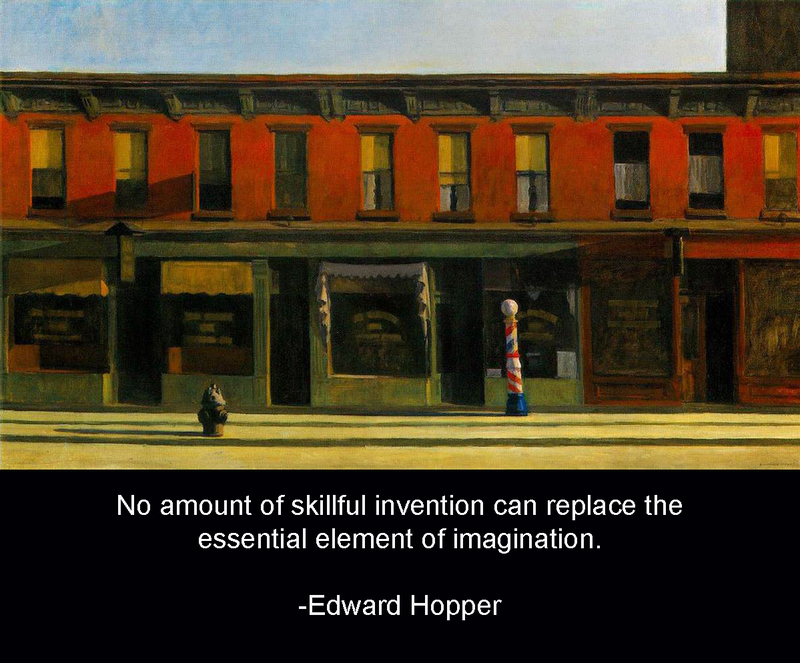 I really just wanted to share one of my favorite Edward Hopper paintings but the message attached really speaks to my own thoughts on painting. The painting is his Early Sunday Morning from 1930. I like that it seems so still, so static, yet it is filled–at least for me– with tensions and deep emotional content. That reaction is my own imagination reacting to the elements of the painting. Hopper created an armature, a framework, that gives shape to the emotional response of the viewer without filling out all of the details. You look at it and there are guides in place that gently direct you to Hopper’s own emotional location. But it never spells it out in great detail, never tells you what you should feel. It relies on your imagination to fill in the voids, to fill it with details to which you can personally relate. You are no longer a mere viewer, you are an emotional participant. That’s how I think a painting should work, as a sort of active terminus where the work of the artist and the imagination of the viewer meet. Sometimes, it works that way. Sometimes, it doesn’t. I think this Hopper definitely works in this way.